The final entry deadline for The 2011 American Business Awards is fast approaching (it's March 31, although late entries will be accepted through April 27 with payment of a late fee). The corporate communications and public relations awards categories are among the most popular in the competition, so we thought we'd take this opportunity to publish Hilton Hotels' Stevie Award-winning Communications or PR Campaign of the Year entry from last year, in order to remind you that virtually all of the past Stevie Award-winning entries are published on the awards' website. You'll find the 2010 honorees in the ABAs here. Hilton Hotels was honored last year in the category of Communications or PR Campaign of the Year - Reputation/Brand Management. The nomination was submitted by Hilton's agency partner, Covalent Logic. 30-40% of all entries submitted to Stevie Awards competitions are submitted by agencies on behalf of their clients, and the entering agency's role in preparing and submitting the nomination is always acknowledged. You'll find the entry kit for The 2011 American Business Awards here. 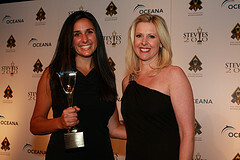 We recently published a tipsheet called 10 Tips for Winning PR Awards in the 2011 Stevies - get it here. 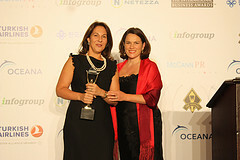 IndoPacific Edelman of Jakarta, Indonesia, won the Stevie Award for Communications or PR Campaign of the Year in Crisis Communications in the PR awards categories of The 2010 International Business Awards. Here we look at their work that earned the Stevie. On September 30, 2009, a 7.9 magnitude earthquake struck in the Indian Ocean, approximately 120 km offshore from the densely populated coastal region of Indonesia’s West Sumatra Province. Despite the epicenter being offshore, the earthquake caused substantial damage throughout the coastal communities, including in the region’s capital, Padang City. Most of the inhabitants of Padang (population: 750,000), as well as an additional 884,500 people living in surrounding areas, were affected in some way by the earthquake. The final death toll came to 1,117, with an additional 1,214 seriously injured. The quake also destroyed hundreds of thousands of homes and businesses throughout the region and caused serious damage to the infrastructure of most remaining buildings. When the government declared a state of emergency, however, national and international media outlets were quickly spreading exaggerated statistics about the quake’s aftermath. In order to prevent panic spreading throughout the entire population of West Sumatra, the Indonesian government, acting through the National Disaster Management Agency (BNPB), called upon IndoPacific Edelman to help get their message out to the public and restore order in the region. IndoPacific Edelman’s crisis response team quickly mobilized and was on the scene within 72 hours of the earthquake. The team immediately established a media center that would provide accurate and reliable information to media outlets from around the world. Minister Kevin Rudd, and U.N. Secretary General Ban Ki-Moon. BNPB reassure the public, the crisis team was able to prevent a panic from making an already difficult situation even worse. The most tangible example of the media center’s contribution was the quantitative measurement of media coverage following the team’s arrival. Once the media center had been established, the number of articles with a negative tone decreased by 62.4 percent in only one week. This quick reduction in negative press coverage underscored the effectiveness of the crisis team in countering misinformation and making the public aware of the reality of the situation. In the month following the earthquake, the number of negative articles written had been reduced to just 9.6 percent. More important still, the ability of IndoPacific Edelman’s crisis team to efficiently manage the media center and all crisis communications was essential in helping restore order following the disaster, and in providing vital information to all parties. This was essential in moving recovery efforts forward in the region. In short, IndoPacific Edelman’s media center brought calm in the midst of chaos. IndoPacific Edelman, a member of Edelman Worldwide, is Indonesia’s largest PR firm, with over 100 employees; it offers corporate communications, public affairs management, crisis management, and consumer PR. In the past six years, IndoPacific Edelman has won an IPRA Frontline Award, a Stevie Award, a Cakram Award as Indonesia’s PR Agency of The Year, a PR Week Award, and an Indonesian IPRA Award. For more information go to www.indopacedelman.com. Aditya Chandra Wardhana is currently IndoPacific Edelman’s Director for Public Affairs. He has been assisting many clients across industry sectors with his insights and strategic counsel. He completed his Ph.D. in Southeast Asian Political Economics at St. Antony’s College, Oxford, UK in July 2004. Ezta Wahyudi is a senior consultant for the firm, providing key support for various programs including running the media centers for the Yogyakarta earthquake, the Mount Merapi disasters, and UNICEF’s Measles Campaign. As a consultant in the Public Affairs division, Patria Pinandita specializes in industrial relations and issue and crisis management. Congratulations to all the winners in this year's Scottish PR awards. 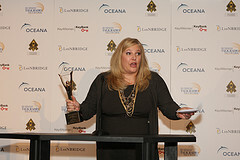 Don't forget to nominate in public relations awards and communications awards categories in The 2011 International Business Awards!